In the irresistible second installment of the New York Times bestselling Chet and Bernie mystery series, which has been hailed as “enchanting [and] one-of-a-kind” (Stephen King), Chet gets a glimpse of the show dog world turned deadly. What first seems like a walk in the park to wise and lovable canine narrator Chet and his human companion Bernie—to investigate threats made against a pretty, pampered show dog—turns into a serious case when Princess and her owner are abducted. To make matters worse, Bernie’s on-again, off-again girlfriend, reporter Susie Sanchez, disappears too. When Chet is separated from Bernie, he’s on his own to put the pieces together, find his way home, and save the day. Spencer Quinn’s “brilliantly original” (Richmond Times-Dispatch) and “masterful” (Los Angeles Times) series combines genuine suspense and intrigue with humor and insight for a tail-wagging good time readers won’t soon forget. The perp looked around—what nasty little eyes he had!—and saw there was nowhere to go. We were in some kind of warehouse, big and shadowy, with a few grimy high-up windows and tall stacks of machine parts. I couldn’t remember how the warehouse fit in, exactly, or even what the whole case was all about; only knew beyond a doubt, from those nasty eyes and that sour end-of-the-line smell, a bit like those kosher pickles Bernie had with his BLTs—I’d tried one; once was enough for the kosher pickles, although I always had time for a BLT—that this guy was the perp. I lunged forward and grabbed him by the pant leg. Case closed. The perp cried out in pain, a horrible, high-pitched sound that made me want to cover my ears. Too bad I can’t do that, but no complaints—I’m happy the way I am (even if my ears don’t match, something I found out about a while back but can’t get into right now). The perp’s noises went on and on and finally it hit me that maybe I had more than just his pant leg. That happened sometimes: my teeth are probably longer than yours and sharper, too. What was that? Yes, the taste of blood. My mistake, but a very exciting one all the same. Bernie came running up from behind. “Good work, Chet,” he said, huffing and puffing. Poor Bernie—he was trying to give up smoking again but not having much luck. I wagged my tail. And maybe, on account of the good mood I was in—what was better than a job well done?—shook my head from side to side a bit. Oh, all right, but how about that taste, human blood? Addictive or what? Hours later we had two checks, one for the arson, one for the jewel heist, and a good thing, too, because our finances were a mess—alimony, child support, a bad investment in some company with plans to make Hawaiian pants just like the Hawaiian shirts Bernie wears on special occasions, and not much work lately except for divorce cases, never any fun. We run a detective agency, me and Bernie, called the Little Detective Agency on account of Little being Bernie’s last name. My name’s Chet, pure and simple. Headquarters is our house on Mesquite Road, a nice place with a big tree out front, perfect for napping under, and the whole canyon easily accessible out back, if it just so happens someone left the gate open. And then, up in the canyon—well, say no more. “This calls for a celebration,” Bernie said. “How about a chew strip?” Was that a serious question? Who says no to a chew strip? He opened the cupboard over the sink, where the chew strips were kept; at one time, a very nice time, they’d been on an open shelf, lower down. “And while we’re at it . . .” Uh-oh. Bernie reached for the bottle of bourbon, standing by the chew strip box. We sat out back, watching the light change on the far side of the canyon as the sun went down, Bernie at the table sipping bourbon, me under it, trying to take my time with the chew strip. This wasn’t any chew strip, but a high-end bacon-flavored rawhide chew from Rover and Company, an outfit owned by our buddy Simon something or other, whom we’d met on a missing-persons case, our specialty. Bacon smell—the best there is—rose all around me, like a dense cloud. I glanced up at Bernie through the glass tabletop. Could he smell it? Probably not. The puniness of his sense of smell—and the sense of smell of humans in general—was something I’ve never gotten used to. Oops. Way over on Bernie’s side. I shifted closer to my door. Drooling? Me? I moved over as far as I could and sat stiffly the rest of the way, back straight, eyes forward, aloof. I wasn’t alone in the drooling department, had seen Bernie drooling in his sleep more than once, and Leda, too, Bernie’s ex-wife, meaning humans drooled, big time. But had I ever made the slightest fuss about it, or thought less of them? You tell me. “What’s what?” said the bartender. Bernie has dark, prominent eyebrows with a language all their own. Sometimes, like now, they grew jagged and his whole face, normally such a nice sight, darkened. “And when the aquifer runs dry, what then?” he said. “Any idea of the current population of the Valley?” Bernie said. “The whole valley?” said the bartender. “Gotta be up there.” Bernie gave him a long look, then ordered a double. Bernie had a burger and another bourbon; steak tips and water for me. His face returned to normal. Whew. Bernie worried about the aquifer a lot and sometimes when he got going couldn’t stop. All our water came from the aquifer—I’d heard him say that over and over, although I’d never laid eyes on this aquifer, whatever it was. I didn’t get it at all: there was plenty of water in the Valley—how else to explain all that spraying on the golf courses, morning and evening, and those beautiful little rainbows the sprinklers made? We had water out the yingyang. I got up and pressed my head against Bernie’s leg. He did some light scratching in that space between my eyes, impossible for me to get to. Ah, bliss. I spotted a French fry under the stool next to Bernie’s and snapped it up. A bourbon or two later, Lieutenant Stine of the Metro PD—a trim little guy in a dark suit—walked in. Bernie had worked for him sometime in the distant past, before my adventures in K-9 school (washing out on the very last day, a long story, but it’s no secret that a cat was involved) and had played some role in Bernie and me getting together, the exact details a bit foggy. Lieutenant Stine glanced down, saw me. He had a thin face and thin lips, didn’t smile much in my experience, but he smiled now, somehow ended up looking a little dangerous. “He’s a good interrogator,” he said. “Understand a tidy reward went along with that,” the lieutenant said. A few stools down the row, a guy in a Hawaiian shirt glanced over. A minute or so later, Bernie and the lieutenant were clinking glasses. I’d lost count of Bernie’s bourbons by now; counting isn’t my strength, not past two. “You have our attention,” said Bernie. “Never heard of it,” Bernie said. “This is different. First, it pays two grand a day. Second, next to a psychotic like Junior Ramirez, this client’s a walk in the park.” Lieutenant Stine laughed that metallic laugh again. “Just about literally,” he said. “Who’s the client?” Bernie said. And, despite my memories of guarding Junior Ramirez—especially that incident with the ice cream and the razor blade—I was glad. Our finances were a mess, and two grand was two grand, and a whole week of two grands was . . . well, I’ll leave that to you. Lieutenant Stine reached into his jacket pocket, took out a photo. I sat up. Bernie was gazing at the photo. I could see it, too. One of my guys was in the picture? Where? And then I spotted her: a tiny fluffball with huge dark eyes, reclining on a satin pillow. I knew satin pillows on account of Leda having had one, although it got chewed up in a kind of frenzy, the details of the episode not too clear in my mind. But that satin taste: so strange and interesting, a vivid memory. I glanced around the Dry Gulch bar: no satin in view. Lieutenant Stine gave Bernie a sideways look. I’d seen other friends of Bernie’s do the same thing, Sergeant Torres at Missing Persons, for example, or Otis DeWayne, our weapons guy—but didn’t know what it meant. “So you don’t want the job?” the lieutenant said. Job? What job? Making sure that a fluffball on a satin pillow stayed out of trouble? That was free money, not a job. Come on, Bernie. “Who’s the owner?” Bernie said. The Hawaiian shirt man glanced over again. “Exactly,” replied the Hawaiian shirt man. And to the bartender when Bernie’s drink came: “I’ll get that.” Then came a lot of back and forth about tin, puts, calls, Bolivia, and other mysteries. My eyelids got heavy, way too heavy to keep open. I let them close, drifted off. Harmless talk was all it was. As long as the checkbook didn’t come out of Bernie’s pocket, we were in good shape. Sometime later I awoke, feeling tip-top. I got up, gave myself a good shake, looked around. The bar was empty except for me, the bartender, the man in the Hawaiian shirt, and Bernie. The only completely sober one was me. Then came the bartender, the man in the Hawaiian shirt, and Bernie, dead last. Also, the checkbook was coming out. This reading group guide for To Fetch a Thief includes an introduction, discussion questions, ideas for enhancing your book club, and a Q&A with author Spencer Quinn. The suggested questions are intended to help your reading group find new and interesting angles and topics for your discussion. We hope that these ideas will enrich your conversation and increase your enjoyment of the book. 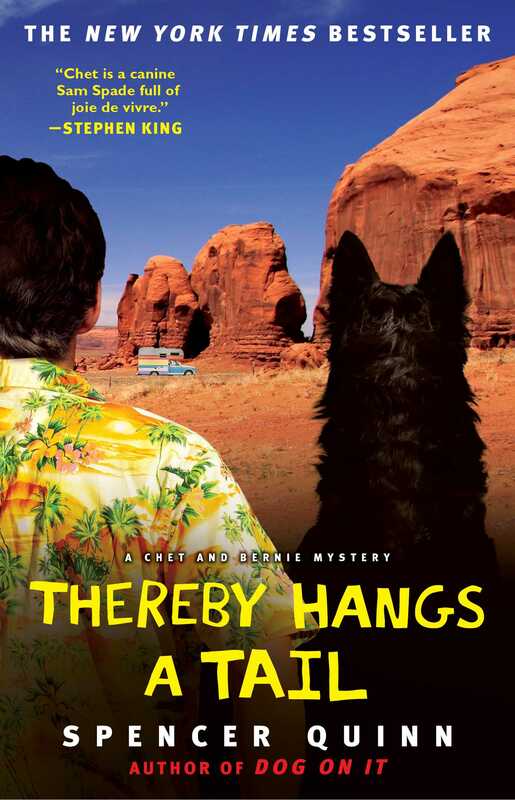 As the third book in the bestselling series of Chet and Bernie mysteries, To Fetch a Thief confirms the standing of rough-and-tumble canine Chet as one of the most unique and beloved narrators in fiction today. With his human partner Bernie, they make an unbeatable detective team. This time, a circus elephant named Peanut has disappeared, along with her trainer. This mystery only deepens for Chet and Bernie as their search takes them across the Mexican border, where they must fight a criminal operation that is powerful, far-reaching—and deadly. How does having a canine narrator affect your understanding of the story? Does it help or hinder? Chet frequently sees beauty in everyday and sometimes even dangerous things: beer droplets flying through the air, a blazing motel fire, even the way the world looks in the morning after he’s been up all night. Contrast Chet’s joyous outlook on life with the violent characters and actions in the story. How do these two disparate aspects play off one another? What larger comment does this make about the power of perspective? Chet often ruminates on the actual process of thinking and has thoughts that enter his mind but go unfinished. He can also sense when people are having thoughts—not what they are thinking about, but the very act of thinking. How does this assist him in his detective work? How does Chet’s thinking about thinking, or metacognition, affect your perception of the story? Chet sees a similarity between Bernie and the little Mexican girl he mistakenly (and hilariously) calls “Pobre” (p. 280). How do you think these two characters are similar? Consider the relationship between Chet and Bernie. In what ways is it like a classic, buddy-detective relationship, and in what ways is it different? At first it would seem that Bernie, as a human, brings the most to the partnership with Chet. However, Chet brings many nonhuman aspects to the table that are essential to their success as a detective team: a superior sense of smell, agility, keen judgment of human facial expressions, and the ability to sense emotions like fear, etc. Is theirs an equal partnership? By the end of the story it seems that Bernie and Suzie Sanchez might be heading toward a more serious relationship. How do you think Chet will be affected by this closer relationship? What kind of dog do you think Chet is? A mutt? Purebred? Why do you think it is never explicitly stated in the story? Marvin Winkleman gets caught using the services at Livia’s brothel, yet he is obsessed with finding out whether his wife is cheating on him and who the other man is. As a cheater himself, why do you think this matters so much to him? When Chet tries to herd Peanut after their escape from the warehouse, he keeps telling himself he’s the one in charge. Is that accurate? Why do you think Peanut eventually trusts him enough to go with him? Why does Bernie decide not to tell Leda about Malcom’s infidelity? Is it solely for Charlie’s benefit? The story contains several examples of relationships where the power is out of balance, as well as those where the power equation is more equal. Identify some examples of each. How does the quality of these relationships compare? Do any of them change by the end of the story? You have a very strong online presence: www.ChetTheDog.com, Facebook, Twitter, etc. Do you feel that the internet allows you to have closer interaction with your readers? Yes, there’s no question. But in a way, since the blog and Twitter are both in Chet’s voice, it’s partly that Chet has the interaction with readers. I wouldn’t want to push this too far, but he does seem real to a lot of readers. Of course—and most especially when I’m actually writing the stories—he seems real to me, too. Having embraced the internet as a communication and promotional tool, what are your thoughts on the increasing number of book reviews posted online by bloggers? Well, why not? Everyone has a right to an opinion. Some of the amateur reviews—and I mean that in the sense of being unpaid—are very well thought out and written. There’s also a love for reading often apparent, too—an emotional investment you don’t sense as much from the pros. Your fans leave an exceptional number of comments on each of your blog entries—a quick count reveals an average of between seventy and one hundred comments for each post. People also seem to love writing in as their dogs, posting photos, etc. Is your blog more popular than you expected? I had no idea what to expect. That a whole community has formed, a community with real fellow-feeling, is just amazing to me. Chet posts about all kinds of things, and also reports on conversations at HQ, with regular appearances by Admin, Spence, and Bernie. There are also serial mysteries, involving some characters from the books and others who may appear later in the series. And don’t forget the occasional pop quiz, with prizes. There are many great photos of dogs (and not just dogs) in the Friends of Chet section. Do you ever meet your fans in person? If so, what is the most valuable or helpful aspect of being face-to-face with them? I do meet readers at signings. It’s just so encouraging to realize you’re giving pleasure to a lot of people. Your writing highlights a keen perception of the mind of a dog as well as a fully fleshed, realistic relationship between Chet and Bernie. Do any particular factors in your own life inform these memorable characters? We’ve always had dogs—or they’ve had us. The rest is just osmosis. Is Chet based on your own dog? Do you have a Chet-and-Bernie type relationship with her? I couldn’t have written this series if I’d been dogless, but Chet came into my head pretty much as a fully-formed character, based on nobody. Audrey does have an independent streak like Chet’s. And she’s very, very enthusiastic about treats. The Chet and Bernie mysteries are a bestselling series, garnering extensive critical praise. Are there any challenges to following up such early and strong success? I never think about things like that. With Chet and Bernie, I’ve stumbled into a fictional world that seems more and more full of writerly possibility. What prompted you to write about illegal trafficking of exotic animals? Partly because of this series, and the preparational thought required, I’ve grown more interested in our relationship with animals in general. Also, the illegal trafficking business in exotic animals is huge, and for me much more interesting as subject matter than yet another crime story about drugs. Particularly memorable in To Fetch a Thief is the contrast between Chet’s appreciation of beauty and the simple joys of life and the violent situations and hopelessness surrounding some of the human characters in the book. 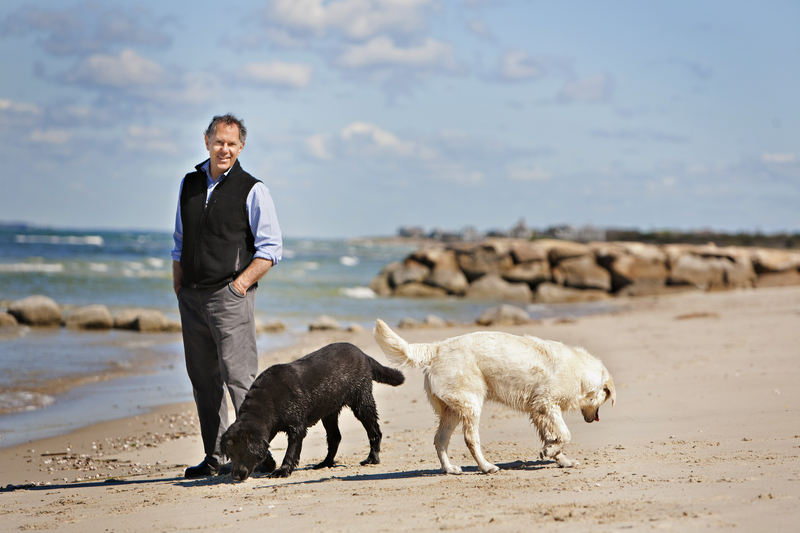 Are you making a comment on the different outlooks of dogs and humans? A comment is definitely being made, but not overtly. I’ll let the thematic stuff speak for itself. What are you working on now? Will any aspect of Chet’s blog make its way into a new story? Yes, some blog material will flow into the books. There are some blog characters like the art expert Muriel Breit, and the troubled family of Colonel Bob from Thereby Hangs a Tail, whom we will see again. Check out the author’s website: www.ChetTheDog.com. You can read Chet’s latest musings in his posts, send in a picture of your own dog, and even comment on the posts in the voice of your pet! Learn more about elephant abuse and what can be done to stop it, as well as elephant sanctuaries like the one where Peanut ended up. Two good places to start are The Elephant Sanctuary in Hohenwald, TN: www.elephants.com and The World Wildlife Center: www.worldwildlife.org. Write a paragraph from the perspective of a dog, cat, other pet, or any kind of animal. Share your stories with the group. Chet often refers to the regrettable outcome of his final test at K-9 school. If it weren’t for Bernie, failing that test would have left him jobless and possibly even homeless. Find out more about homeless dogs and other pets at the ASPCA: www.aspca.org.